The department is recently equipped with Metafer, automatic metaphase and interphase scanning and capturing system for Karyotyping and FISH (Fluorescence In Situ Hybridization) assays. It has fully motorized epi-fluorescence microscope (Imager.Z2) from Zeiss, Germany with special filter sets for FISH and multicolor FISH. It has IKAROS software for Karyotyping and ISIS software for FISH by Metasystems, Germany. The system also has facility of automatic spot counting for FISH analysis for hematological malignancies and solid tumor using Metacyte software. It has 4 review stations. Moreover, the division also has three other systems from Metasystems, Germany and Cytovision software by Applied Imaging, USA. In addition to Karyotyping, FISH (Fluorescence in situ hybridization), M-FISH (multicolor FISH) and generation of custom made FISH probes from Bacterial artificial chromosomes also provides precise chromosomal breakpoint mapping in leukemia as well as in solid tumor patients. For FISH automation, hybridization and, denaturation chamber (Thermobrite, Vysis, USA) helps in rapid and consistent FISH assays. The facility for multiplex-FISH is first of its kind in the country. 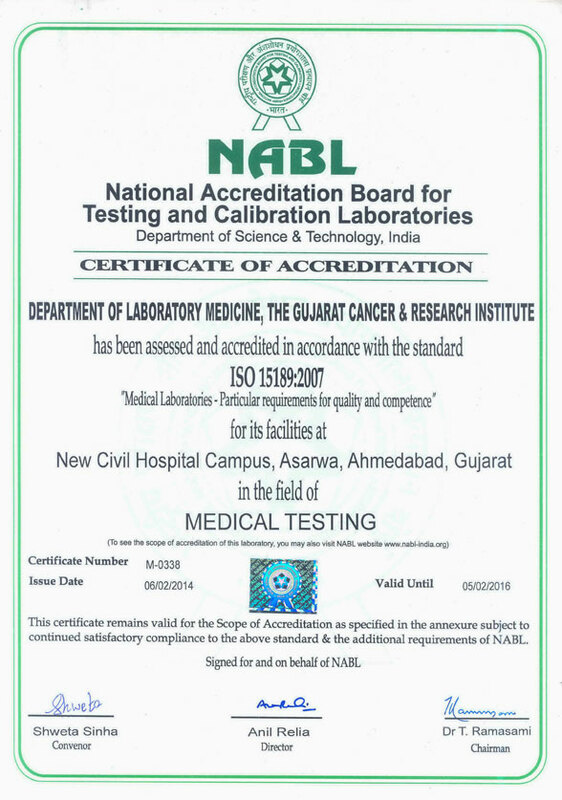 Cell Biology Division is equipped with the state of art set up for research in the area of clinical cytogenetics. The division is actively engaged in research on various aspects of chromosomal abnormalities. Major clinical services provided by the division are for diagnosis and prognostication of patients with various hematological malignancies. The services are provided to the GCRI patients as well as other cases referred from various other places. The division caters extensive clinical cytogenetic services for leukemia patients. It includes karyotype and FISH analysis in CML, AML, and various other hematological malignancies to help diagnosis and prognosis. The department has also initiated solid tumor FISH from FFPE sections. It includes HER-2 neu gene rearrangements in breast cancer, N-MYC gene rearrangements in neuroblastoma, i(12p) gene rearrangements in Germ Cell Tumor and ALK gene rearrangements in NSCLC. The division enrolled graduate and post-graduate students from universities across India for observership, project work and dissertation. Staff of the division is involved in M.Sc. Cancer Biology course for theory and practical work, initiated by Department of Cancer Biology at GCRI. The main research thrust of the division is chromosome analysis of leukemia patients. Chromosomal anomalies are documented at diagnosis and during later stages of the disease, which aids in prognostication and clinical research. Metaphase chromosomes are obtained following short-term cultures of peripheral blood lymphocytes and bone marrow. The novel chromosomal anomalies as per the leukemia subtypes are contributed to existing pool of databases of chromosomal aberrations in leukemia by publishing in national and international journals. Karyotype analysis by GTG banded metaphases is substantiated by locus specific and/or whole chromosome FISH in leukemia and solid tumor, and multiplex-FISH for increased sensitivity of chromosome anomaly detection. Generation of custom made FISH probes from Bacterial artifficial chromosomes to identify novel chromosomal breakpoints.